India is a land of fertile plains and remote mountains, uncomfortably beautiful in her raw and naked form that she presents so unabashedly. It is no surprise that the world calls her Incredible India. The Lahaul-Spiti valley attracts fewer tourists in October. 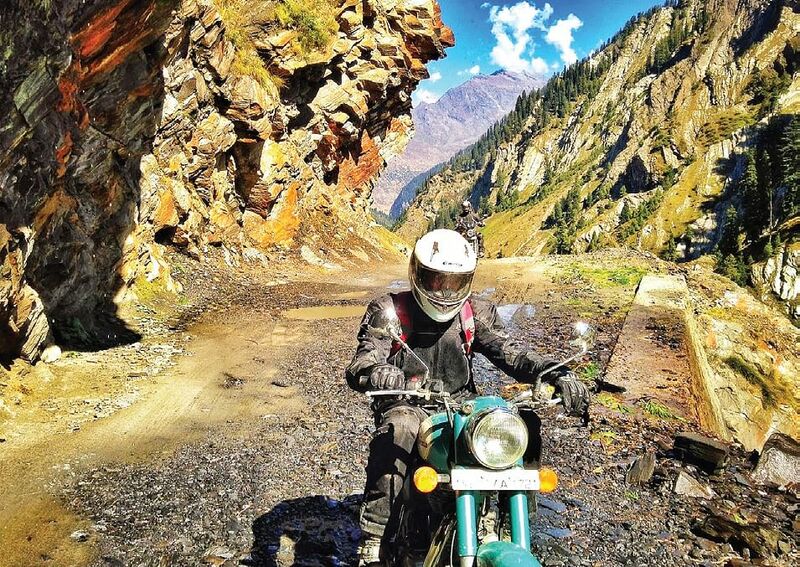 It is around this time that bikers decide to take on one of the most dangerous roads of the Queen of Hills—Himachal Pradesh, a state that has a bounty of green verdant valleys, gushing streams, snow-capped peaks, limpid lakes, medieval shrines milling with pilgrims, pristine hill resorts overlooking lush green slopes, adventure sports and beautiful people. After starting from Mumbai, for about 1,800 km one gets to cruise on the well-paved roads of National Highway 8. This smooth ride continues all the way until Pathankot which turns out to be the last stop in Punjab before entering Himachal Pradesh. The moment one crosses over, a breathtaking transformation of scenery happens. The fertile lands and sunflower fields give way to an ever-increasing incline, climbing up all the way into the horizon. The dull, overcast morning began to bleed red as the large glowing sphere rose slowly, casting its light in every direction. The cool night breeze spent its final breath when the sky turned more and more radiant, casting its illuminating glow on the town ahead—a town called Chamba. The first memory of Chamba is of a pleasant morning, stopping for hot tea and chilly-garnished egg bhurji pav at 3,300 feet at a dhaba overlooking the banks of the placid Ravi River. Ravi accompanies one all the way to Banjraru, about 70 km further north. From here, it was a constant contrast of experience between the stunning scenery and narrow winding roads, which cropped blind corners every now and then. The two-way road is treacherously perched at places over broken tarmac and sometimes gravel-laden paths barely two metres wide. After resting at the HP government guest house at night, one can look forward to riding on to Sach Pass. At an altitude of 14,500 feet, Sach is a pivotal link between Chamba and Pangi valley. What makes this ride from Chamba all the way through Pangi Valley unique is the extremely inhospitable terrain riddled with the dangers of falling debris like rocks, twigs and tree trunks that rest precariously on the mountainsides. This coupled with the streams of ice-cold water gushing down the face of the rocks into the path ahead makes riding a risky venture as the wheels often slip away from their tracks, demanding extreme deftness and caution. The terrain is susceptible to landslides and considering the onset of winter, some tracks were already covered with snow—all of which combined to make the ride difficult, but also memorable. It takes a ride through the Pangal valley to know the life of the locals better. Most of the Pangals can be seen collecting wood from the slopes, fishing in the lakes nearby or herding cattle. They are fair-skinned, shy and of athletic build. Considering they could speak a little Hindi besides Pangwali (the local language), one can also enjoy the opportunity to both dine and even live with them. At the top of Sach Pass stands a Devi temple erected by the locals. It has a pristine feel, undefended by gates or teeming with people, unpretentiously rustic and intensely welcoming on the podium of rocks it is built on. It’s a perfect time for a stopover, and treat oneself to the sight of the valleys that doze below over which Sach Pass stands benevolently. Sach will beckon you again and again with its savage beauty and warm hospitality along the way. One can ride all the way down to Keylong and culminate a surreal journey, but that is another story.